Hamburger model is a good way to engage students in practicing writing. Download the printable hamburger graphic organizer template for free. The hamburger model, which is also called the sandwich model, is a kind of writing technique used to help students construct a paragraph or essay. 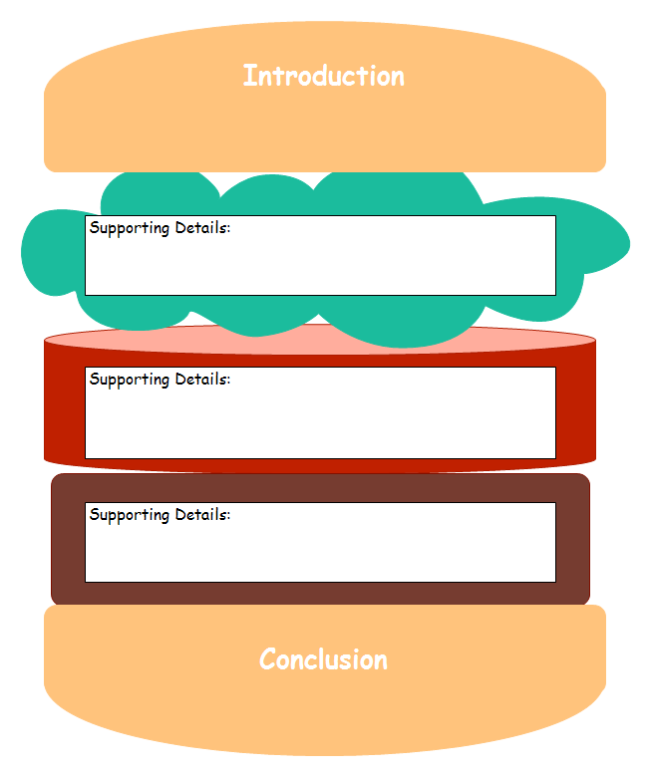 Using this hamburger model can help students write focused, clear paragraphs, because it follows the regular paragraph pattern - the "introduction - supporting details - conclusion" pattern. The Top Bun: It represents the topic sentence of the graph. This sentence introduces an overall idea that you want to discuss later in the paragraph. The Middle Section: The middle part gives reasons, details, and explanations etc, to support the main topic sentence. The Bottom Bun: It represents the conclusion sentence of the paragraph. Note: The hamburger only provides a basic structure, but it doesn't teach the connection between ideas. Click the image below you can download this hamburger graphic organizer template. It has two formats available, PDF and EDDX. The EDDX format is editable but you need to open it with Edraw.